Melissa here with some inspiration from May’s sketch that Chari Moss created for us and fellow DT chickadee Leslie posted about HERE. I knew I wanted to use the sketch and some Hero Arts layering paper in the sunshine family. Then I pulled a stamp set I hadn’t used and went to it! The house is colored with Copics, I’m still learning! I thought the Cherry Red Timeless Twine added a good punch of color since the color palette is very warm and yellow-y. **Please note: If you plan to play along, please use this graphic instead of my hacked versions. I thank you. I used one paper in the center and a different paper for the strips down the sides. I used a border die for the scallop element instead of scallops, but otherwise it’s pretty much true to the sketch. This is actually the first card I made, because I had a bunch of parts-is-parts all over my desk and they needed to be used. I used the numbers for the two sides (now top & bottom), and left the center white, but I embossed it to make it even busier. Ugh. Then I wondered what would happen if I cut a curved die and tried to straighten it out, so I did, and it worked. 🙂 The red banners are a Simon Says Stamp die that is actually cut on a curve. It was no match for glue dots, though; I tamed it into submission. I decided I needed a yellow element, so I die-cut some stars, then I felt it needed even more yellow, so I die-cut some more stars and added them to the banners. The only diversion from the sketch here is the sentiment, which I re-oriented to work. I’m not sure it’s possible to have added any more to that card. Stuff I used that’s not listed below: MFT stars die, Navy & White twine on the 4th card is from Whisker Graphics (Divine Twine), Darice embossing folder on the 4th card, The Twinery Ocean twine on the 3rd card, misc yellow washi tape on the 3rd card. I just poked a hole with my paper piercer and threaded the twine through. 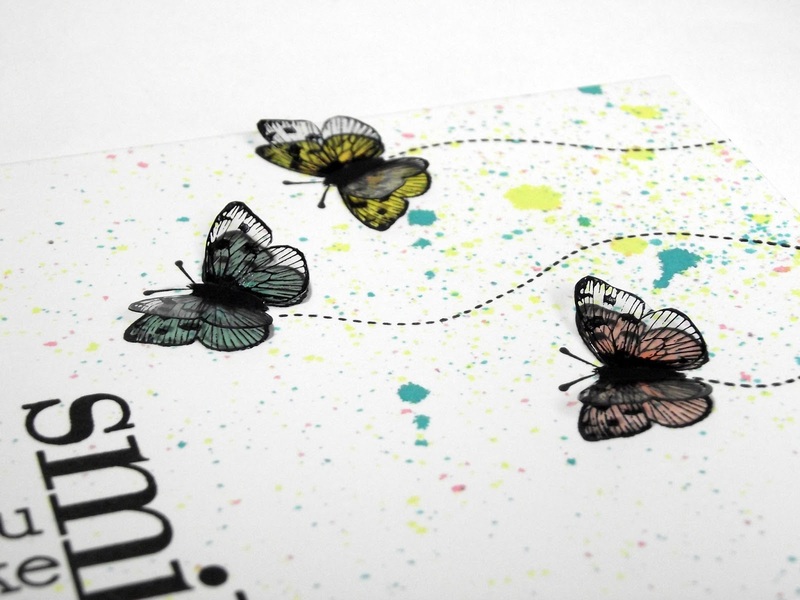 The strip of card stock covers it up and makes it look like magic. Gotta love it. I lost all the paper layers and instead went with stamps to represent the different sections of the sketch. I started out with the banner stamp from My Happy, masked the top of the card because I’m sloppy and tired of doing things over and over again, then stamped it vertically on the bottom half of the card. Then I ran a line of tape across the center as a mask and stamped the Envelope Background just on the top of the card front. Instead of a heart I used some stamps from My Happy, and for the sentiment I stamped the XOXO from Year Round Sentiments sideways. The circle is popped up on dimensional adhesive. I used the bike for the heart element, left off the vertical line, and moved the sentiment. I think this is a good example of starting with a sketch as inspiration, then making it your own. Products used but not linked below: SU Cranberry Crisp, Buckeroo Blue and Sahara Sand card stock; SU Cranberry Crisp ink; SU black grosgrain ribbon; black sharpie (bike seat, pedals and handlebars). It’s Cristina here, and it’s my turn to share some cards with you. First of all, I should tell you that my mojo has been gone for the last couple of weeks. I have been on my craft room, trying to get the inspiration back, with no success. But then Leslie (our sketch Master) wrote an awesome post on Friday with lots of great ideas on how to approach an sketch and how to use it differently. I LOVED those ideas! Because I always have problems using the sketch JUST as the starting point and my cards tend to look exactly like the sketch. So I decided to use this to kickstart my inspiration and try to change the sketch to fit my needs. Instead of hearts, I saw flowers, and I didn’t want to have just three, so this stamp was perfect. I embossed it over watercolor paper, and then used distress inks and stains to create an Ombre Background (one of my favorite trends). 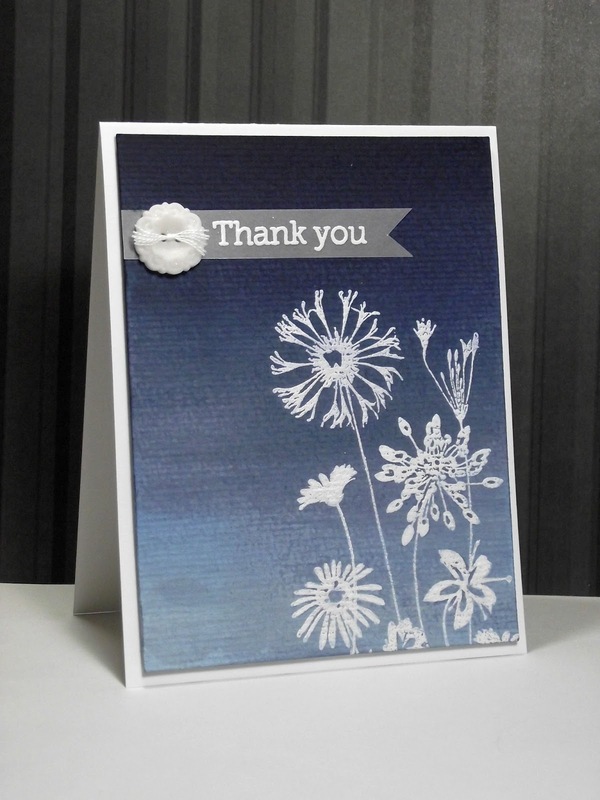 For the sentiment I used some vellum and a gorgeous button from Mossy Made. I wanted the sentiment over the arrows, cause it made more sense. 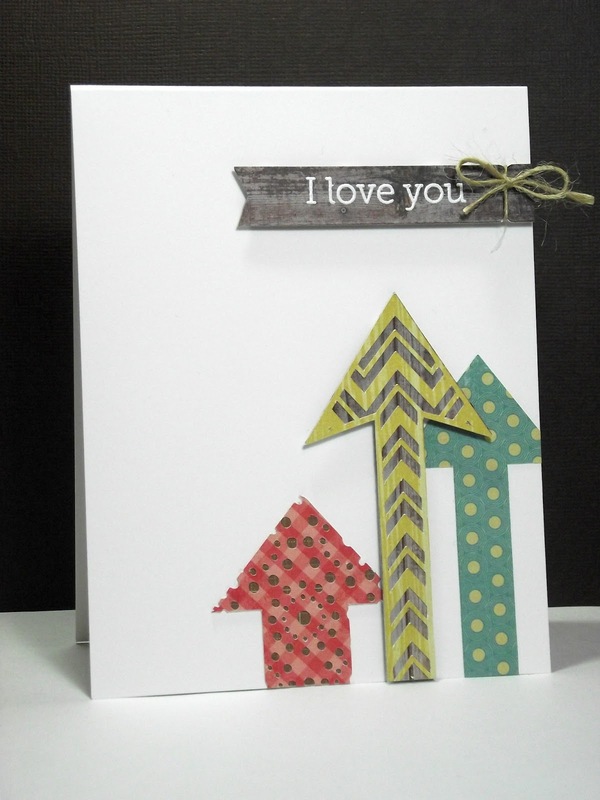 Those arrows are Hero Arts die cuts for the Silhouette. Love the new ones that they released for Valentine’s Day! 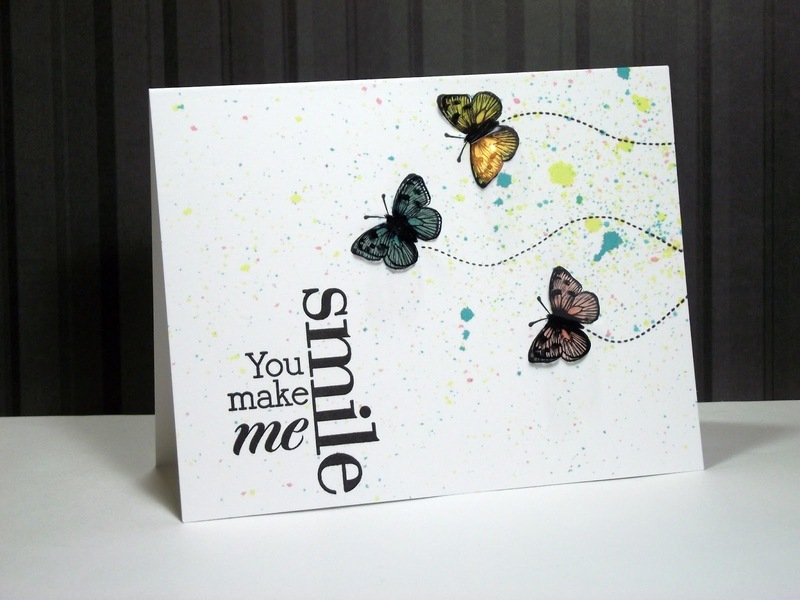 In this case I changed the hearts for butterflies, and I decided to use one of my favorite sentiments from Hero Arts. 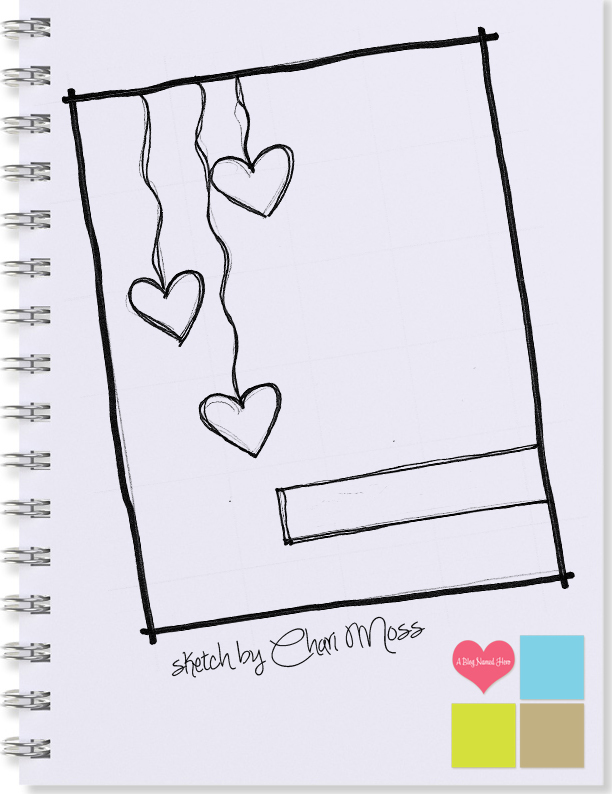 So I should thank Leslie for bringing my mojo back with her great post and for sharing awesome tips to see sketches differently. 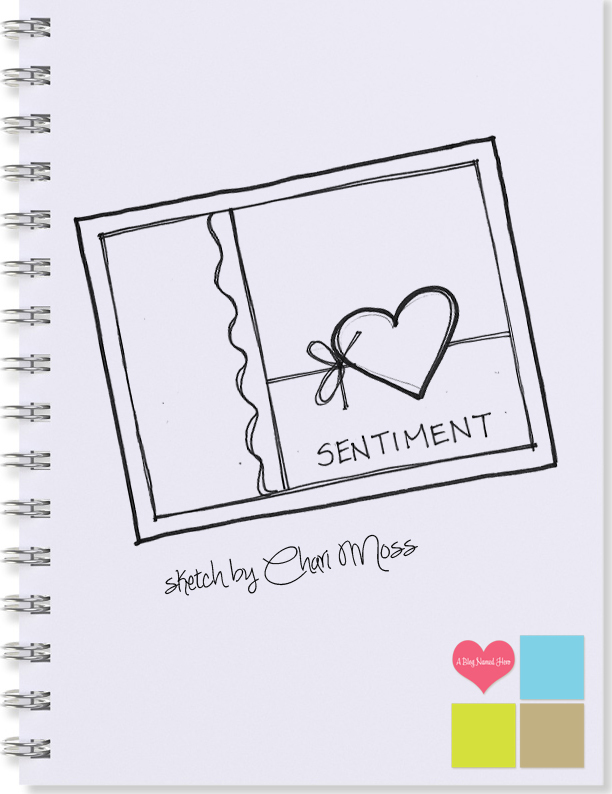 I may or may not be addicted to sketch challenges, so the lovely Linda and Mary Dawn have asked me to pop in once a month, give you a sketch drawn by the talented and most-generous Chari Moss, then show you what I do with that sketch. I know some people are scared of sketches; I know several “no, no, no, I can’t do sketches” mental block types; others who can only do them exactly as they are drawn; and a batch of people who blow me away with their interpretations. We’re not going anywhere near that last one, but all that other stuff is fair game to me, and I hope to provide you with some insight. For the patriotic one, I didn’t even make a banner; I just used the idea of the banner and used washi tape and a stamped sentiment. See? That wasn’t so difficult. 🙂 It’s still a literal interpretation, but with a twist. Okay, yeah, I changed the orientation, too, but can you still see the sketch? I didn’t use strings, and I made the sentiment way longer than the sketch element which is why I made the card portrait instead of landscape, but the idea is still there. Most sketch challenges let you use the sketch as a jumping-off point, and you can mix things up as long as they can still “see” the original sketch. I take a lot of liberties with sketches, and it really is a great way for me to get started on a card, since (for me) the design can sometimes be the most difficult part of making the card. I hope I’ve given you some ideas and some things to think about. If you have any questions, please feel free to ask. Also, as we travel this new road together, I’m open to suggestions for things you’d like to see in future sketch posts, and I’ll do my best to incorporate them.